Visit this page to try all the AY 201b students’ online modules. These modules were developed as a part of the AY 201b course at Harvard. For the course, we (Professor Alyssa Goodman, Chris Faesi, and I) asked each graduate student to develop an online software module that they could use to teach their peers, and other students around the world, about one aspect of the interstellar medium. Our goal was to go beyond the standard term paper project — to introduce the students to new technical and communication tools alongside their research on a particular concept from the curriculum. 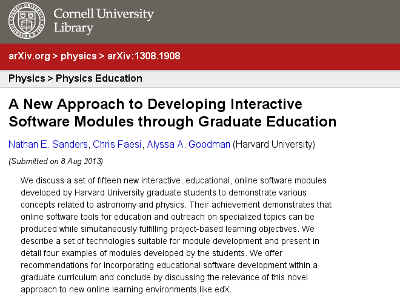 arXiv:1308.1908, our paper describing how astronomy students have created amazing online interactive modules for education as part of a graduate course. These modules are a great complement to the work we do at Astrobites and our new project, Astroplots. Each student has picked a concept from astronomy and sought to make it more accessible. We do that through research articles on Astrobites. through figures on Astroplots, and these students have done it using interactive technologies. You can see all the students’ finished modules at the AY 201b website. If you would like to know more about how these modules were developed, see the paper we posted on the arXiv today. We hope this software will be a useful resource to Astrobites readers, and may even prompt you to create your own modules! Have you made a software demonstration or interactive simulation of this kind? Have you seen other exciting takes on the traditional term project? Please leave a comment below or send us a note.